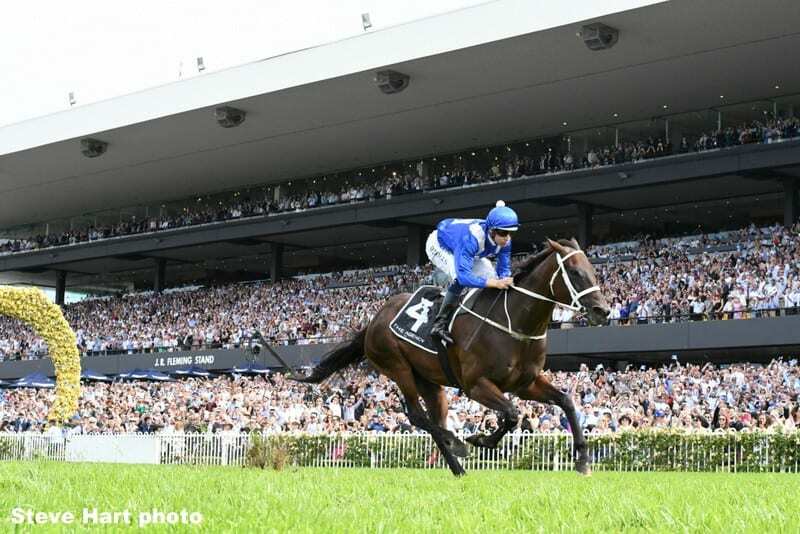 Australia's super mare Winx has her sights on a grand farewell in the G1 Queen Elizabeth Stakes, set for Day 2 of The Championships at Sydney's Royal Randwick racecourse, on Friday April 12th. In what will be her final appearance, Winx will look to topple US racing legend Arrogate as the all-time leading money earner, with over AU$24 million (US$17 million) in prize money. Though her reign has been dominant, discussions persist as to whether Winx is, indeed, the greatest of all time. The case was further bolstered earlier this week when she emerged victorious in the Daily Telegraph's Wonder Race, a simulated race organized by Racing NSW, in which Winx topped Australian turf icons such as Phar lap, Kingston Town, Sunline, and Makybe Diva. International horse racing fans may still be hoping to see the matter settled on international stages such as Paris' Prix de l'Arc de Triomphe, the Breeders' Cup Classic or the Queen Anne Stakes at Ascot, where Winx could potentially compete should connections have a change of heart. The day's other G1 races include The Sydney Cup, Australian Oaks, and Coolmore Legacy Stakes. The day's first race goes to post at 11:25 a.m. Sydney time on Saturday, April 13th (9:25 p.m. EDT or 6:25 p.m. PDT on Friday, April 12th). The Queen Elizabeth Stakes will run at 3:05 p.m. Sydney time on Saturday, April 13th (1:05 a.m. EDT or 10:05 p.m. PDT on Friday night). TVG will be trackside to capture all the action via live coverage, which will feature commentary by TVG's Candice Hare and Sky Racing World's Jason Witham. The richest event of the Sydney autumn carnival has Winx set as a short-priced favorite to take her consecutive winning record to 33 in a row. Winx is the two-time defending champion in the Queen Elizabeth, coming off a historic run in the G1 George Ryder Stakes, where she pulled off a four-peat. Ready to test Winx in her final contest are Pat Webster's Happy Clapper and James Cummings' Hartnell. Happy Clapper (20/1) has raced the mare eleven times, most recently in the G1 Chipping Norton Stakes as runner-up. He also finished third in last year's Queen Elizabeth. Hartnell, listed at the same odds as Happy Clapper, previously encountered Winx in the 2017 Queen Elizabeth Stakes, where he placed second. Former European He's Eminent (by Frankel) will provide fresh competition alongside the Japanese-trained Kluger who ran 4th in the G1 Doncaster last week in preparation for this race. He's Eminent impressed during his introduction to the Australian audience, running second to Avilius in the G1 Ranvet Stakes (2000m). He is now listed as second favorite at 14/1 and will be out to spoil the party. The Group 1 (AU$2 million/US$1.4 million) Sydney Cup has accepted a capacity field of 20 runners, plus one emergency. In a run that marks his debut in Australia and at the Group 1 level, the Godolphin gelding Dubhe leads the line at odds of 5/2 over Liam Howley's G3 Manion Cup winner Midterm (15/2) and Tancred Stakes runner up Big Duke (9/1). Dubhe is being primed by British trainer Charlie Appleby, who won the 2017 Breeders' Cup Filly & Mare Turf with Wuheida and the 2018 Breeders' Cup Juvenile Turf with Line of Duty. The Group 1 Australian Oaks (AU$1 million/US$700,000) will bring together the G1 Vinery Stud Stakes trifecta for a rematch. The Chris Waller-trained filly Verry Elleegant, first in that race, heads into the Oaks as a 7/10 favorite. Frankely Awesome and Aristia, second and third in the Vinery, are at 5/1 and 7/1, respectively. They will join Kris Lees-trained Aliferous (20/1), who received an automatic berth into the race with an upset win in the G3 Adrian Knox Stakes on Day 1 of The Championships. Godolphin also has the race favorite in the Group 1 AU$1 million Coolmore Legacy Stakes. Their star filly Alizee has won two races in her last four starts – the G1 Futurity Stakes and G2 Expressway Stakes. She also ran third in the inaugural All Star Mile, followed by a 17th finish in the Doncaster Mile. Despite the setback, bookmakers have been convinced by her recent form, as she leads the field with 5/1 odds. She will be jumping from barrier 12 with Hugh Bowman assuming racing duties from Blake Shinn. The Coolmore Legacy will be a run of fillies with established resumes in the field. G1 Surround Stakes and G2 Light Fingers Stakes winner Nakeeta Jane is right behind Alizee at 15/2, but will be further out in the rails, racing from gate 18. Amphitrite, third up in the G1 Australian Guineas and first in the G3 The Vanity, is at 8/1. Dixie Blossoms, the G1 Coolmore Classic winner and daughter of US horse Street Sense, is next best at 10/1. TVG will supply live coverage from Randwick with trackside commentary by TVG's Candice Hare and Sky Racing World's Jason Witham. Live-streaming in HD will be available on skyracingworld.com and major ADW platforms such as TVG, TwinSpires, Xpressbet, NYRABets, WatchandWager, HPIbet, AmWager, and BetAmerica. Wagering is also available via these ADW platforms. Fans can get free access to live-streaming, past performances and expert picks on all races at skyracingworld.com. A former Managing Director of Sportech Racing, David was appointed President and CEO of Sky Racing World in April 2014. The Louisville, Kentucky-based company, a subsidiary of Australian wagering firm Tabcorp, provides Australian, New Zealand, South African and South Korean thoroughbred racing and Australian Harness racing content for simulcast horse-race wagering to multiple North America-facing ADW brands and race-tracks. This entry was posted in Horseplayers, NL List and tagged Australia's The Championships, Australian racing, David Haslett, sky racing world, The Championships, winx by David Haslett. Bookmark the permalink.